David Ziskind, JD ’00, died in November. After graduation, Ziskind worked as a corporate associate at Dewey and LeBoeuf (2000-01); an intellectual property litigation associate at Howrey (2001-04), Weil Gotshal & Manges (2004-06), and Sonnenschein Nath & Rosenthal (2006-08); a consultant at VLIW Technology (2008-11); a patent examiner at the United States Patent and Trademark Office (2010-11); IP counsel at General Patent Corporation (2011-18); and IP attorney at Cooper Legal Group (2018). Ziskind is survived by his sister, Rivka. Christopher Michael Griffith, JD ’00, died on September 17th, 2016, at the age of 40. Over the course of his career, Griffith served as a senior policy advisor and director of public affairs to the special inspector general for Iraq reconstruction; as a senior advisor to Afghanistan’s Independent Joint Anti-Corruption Monitoring and Evaluation Committee; and as a consultant to the U.S. Department of State and an advisor to Iraq’s Commission on Public Integrity. Griffith spent three years in Iraq, where he was a key official in several high-profile anti-corruption cases and worked to secure asylum for Iraqi officials opposed to Saddam Hussein’s Baath Party. He is survived by aunts and uncles Charles, Donald, Margie, Terry, Thomas, and Willie; and numerous cousins. Joachim (Jay) H. Ong, JD ’00, became a shareholder in the Austin office of Munsch Hardt, where he is a member of the firm’s bankruptcy, restructuring, and insolvency group. Ong focuses his practice on bankruptcy, reorganization, and creditors’ rights as well as corporate finance and commercial litigation, with extensive experience representing senior lenders, trustees, debtors, committees, receivers, trade creditors, bond holders, and commercial defendants. Since 2006, he has also served as co-head coach of the University of Texas School of Law National Bankruptcy Moot Court competition team. Tina M. Foster, JD '00, became executive director of the Volunteer Legal Services Project in October 2017. Prior to joining VLSP, Foster worked as executive director of International Justice Network (2006-17), litigation coordinator at Yale Law School (2008-10), an attorney at the Center for Constitutional Rights (2004-06), and a litigation associate at Clifford Chance (2001-04). 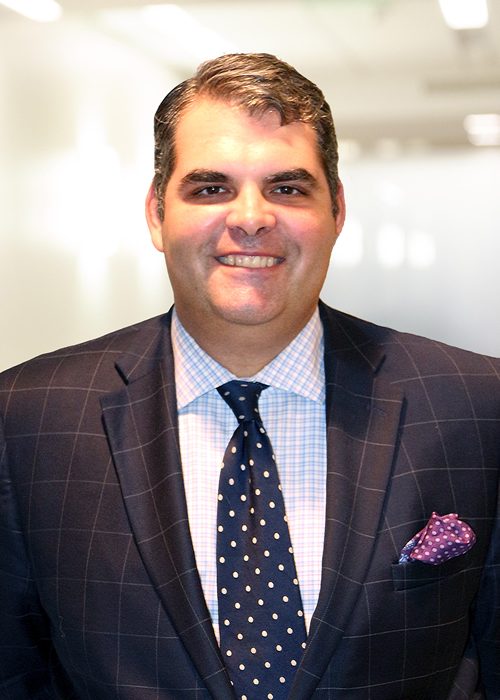 Douglas Fraser MacLean, MBA '00, JD '00, died on February 6th at the age of 45. MacLean practiced law in Boston, focusing on banking, business law, and real estate, and worked as chief compliance officer at Camber Capital Management; he was also the founder of Armor Compliance of Boston and Marblehead, a charitable organization to benefit students. He is survived by his wife, Hadley; children Grace, Graham, James, and Phinneas; parents Deborah and Malcolm; brother Malcolm IV; and five nieces and nephews..
Brian A. Rosenthal, JD '00, joined the New York City office of Gibson, Dunn & Crutcher as a partner in the firm's intellectual property practice. For the past 16 years, Rosenthal has focused on complex patent litigation and licensing, with a concentration in the computer software, electronics, and medical device industries. He has significant experience litigating before the U.S. Patent and Trademark Office's Patent Trial and Appeal Board, including inter partes review, business method petitions, and inter partes and ex parte reexaminations. "Brian is a terrific addition to the firm," said Managing Partner Ken Doran. "He is a talented IP lawyer with extensive trial experience. He has a terrific reputation as a strategist, counselor, and trial lawyer. Our IP practice is extremely busy, and Brian will add additional depth to help us meet client demand in this area." Matthew L. Mitchell, JD '00, joined Partridge Snow & Hahn as of counsel in the firm's Boston office, where he represents employers in a broad range of employment-related matters, including employment discrimination, sexual harassment, non-competition and confidentiality agreements, wage-hour issues, and family and medical leave. Prior to Partridge Snow & Hahn, Mitchell was a partner at Holland & Knight. "Matt is a tremendous asset to our firm," said Managing Partner David Gilden. "The knowledge and energy he brings to the area of employment law expands our capabilities and provides further depth to our existing practice for clients in the Boston market and throughout Massachusetts."